As a day-to-day phone, however, the design and ability of this mid-ranger are considerable. It's an upgrade over the previous model that will give plenty of competitors a run for their money. And yet, despite dual cameras being a fun feature, they don't add up to top the OnePlus 3. That's not so much the Honor 8's shortcoming as it is the OnePlus' class-leading position. In the mid-range phone market there's a top dog: the OnePlus 3. That phone has essentially blown the doors off what a device can provide at a £330 price point. And that, right there, is exactly the territory Honor - the subsidiary brand of Chinese supergiant Huawei - wants to strike with the Honor 8. 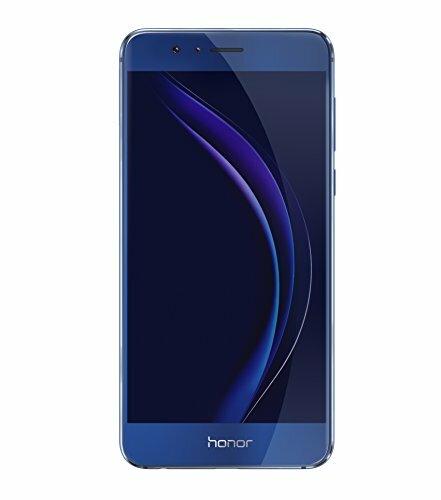 The 5.2-inch Honor 8, with its alluring dual camera feature (as ripped from the Huawei P9) offers other seemingly top-spec features, too, including Huawei's best-available HiSilicon Kirin 950 processor, making it a notable upgrade over the previous Honor 7. Does all that make the Honor 8 more than the sum of the OnePlus 3? And is this little-known brand (in the UK, at least) worthy of merit? There was a time when mid-range phones meant plasticky build and general unsightlines. But that's an era gone by, and all the better for it. Because the Honor 8 is a rather good-looking phone; the kind of device you would think is more premium and expensive than it is. Although with its US $400 and UK £370 price tag, it's not quite knocking on OnePlus' £330 door). It's also a spitting image of the latest iPhone, a point that many will make, but with different colour finishes that give it a certain individualism (slash Samsungism). In its blue finish our review device looks rather spangly straight out of the box. Handle it for more than five minutes, though, and it's a fingerprint-smeared image of its former self. The Honor 8 is an absolute grease magnet, even with the included rear plastic clip-on protector on. But, hey, Samsung has exactly the same issue with the Galaxy S7, so if that's acceptable then, well, we can see why Honor has followed suit. There are some fancy pants finishes to the Honor 8's design that are particularly standout: the rear has a 15-layer etched design that, while you won't count all those layers of etching, catches the light nicely and gives it a certain enhanced three-dimensional quality. Both sides are glass-coated too, with 2.5D glass no less, which means its edges are curved to not only look good, but give the screen image the sense of popping away from the device slightly. There are other commendable features in the design: from the built-in microSD tray - meaning expansion up to an additional 128GB is possible (in addition to the base 32/64GB on board storage) - to the Fast Charge USB Type-C port to its base. The power and volume buttons are both close together on the one side, however, which feels a bit tight - but you'll quickly get used to it, even if it does make taking a screengrab a little more laborious. If there's any apparent criticism then it's Honor's will for you to know that the Honor 8 is, yes, an Honor. The brand's logo sits pride of place on the front towards the base, but also to the rear - and we're not really sure that's needed. Just the once would do, thanks. Size wise, 5.2-inches might sound large, but it's really not these days. For us it's the perfect size, not expanding out to the her-yuge scale of the Huawei Mate 8. It still embodies many of the features of said larger phone, though, including a rear fingerprint scanner that is, quite simply, up there with the very best on the market - it's faster than Apple's current top offering, at least. There are even three customisable controls accessible via this fingerprint scanner, such as a sustained press activating a chosen app, such as Twitter, for example. Contextually, as an upgrade to the Honor 7, the Honor 8 is a tad thinner (it's 7.45mm rather than 8.5mm) and all-round better looking. Design has been stepped up, aping many of the current best-in-class devices out there. Crucially it looks different and smaller than the OnePlus 3 too, which gives it an angle of differentiation. Also like the Huawei Mate 8, the Honor 8 embodies a HiSilicon Kirin 950 (4x Cortex A72 2.3GHz and 4x Cortex A53 1.8GHz processors), paired with 4GB RAM. On paper that's spot on, as the best the brand has to offer. In practice it's been largely spot on, too, but not perfect. Some games - and not even ultra high-end ones, such as Candy Crush Saga - have exhibited brief "hangs" or stuttery frame-rates that we wouldn't expect from a device of this specification. Over time, by day five of testing, this seems to have smoothed itself out with few notable issues. It's also worth noting that there are three battery options, with the "smart" one slightly limiting the CPU - we suggest opting for "performance" each and every time as it has little impact on longevity. We've also had a couple of time-outs in apps that have gone on to crash, which may be down to those individual apps - but they aren't ones we've had an issue with in identical setups from our previous LG G5 arrangement - or could be down to Huawei's EMUI software re-skin, which refashions Android 6.0 into a marginally different beast. If you're not au fait with the ins and outs of the Android operating system then you'll not struggle with Honor's reimagining. It's easy to use, doesn't force-feed you unnecessary baked-in apps (ok, so there's News Republic on this US-sourced handset, but push notifications from this can be cancelled easily), but overall it can be a little fussy in some areas. For example, EMUI will persistently alert you to power-consuming apps, for example, which can be useful for the sake of longevity, but gets irritating after a while. Some apps will time-out if you've not set individual permissions too - in the Mr Robot game by Tell Tale Games we have to keep touching the screen to stop it blacking out, which is annoying. Really, though, there's no longer a huge amount about EMUI that makes it overbearing, unlike earlier iterations of the software. Plus, in EMUI 4.1, there are a bunch of interesting features, the majority of which are off by default - but that you may choose to use. From knuckle controls - by using your harder knuckle to clack against the screen for different functions - through to smart orientation controls, such as muting the phone by flipping it over. It's all here. The knuckle controls can be used to write a letter on screen to quick activate an app, for example, such as "C" for camera - but we've never found ourselves using it, as hitting a shortcut is just as, if not more, effective. Still, hats of to Honor/Huawei for trying something different. As a general phone we've found the Honor 8 highly effective for day-to-day tasks. It's quick to jostle between apps and screens, with lightweight apps causing no problems. We suspect it's a graphics issue that occasionally hampers more demanding tasks, especially if you don't delve deep into the battery settings to switch from "smart" to "performance". The Honor 8's screen is a Full HD panel (1920 x 1080 pixels, 423ppi), so not flagship, but with a 5.2-inch diagonal that's plenty of resolution for crisp imagery. Given the approaching-£400 price point, however, we thought perhaps there might be some extra show-off resolution in this model, but it's not to be. There's quite a lot of granular detail to the screen's controls, too. From colour balance adjustment (including warm and cool presets), through to a low-res mode to further assist battery consumption and, therefore, longevity. To our eyes the screen looks good. In our pictures it looks very cyan, but you'll only really get that effect from an angle and when brightness is pumped right up. Auto brightness is another interesting point: it doesn't always work effectively, sometimes failing to adjust to ambient lighting. Still, there's enough brightness to cut through all kinds of conditions - we've been testing it in the San Franciscan sun and fog - while colour is decent, if not a touch overly pumped at maximum brightness. In isolation there's little to moan about from the Honor 8's screen though. And that resolution sweet spot ought to be a bonus for battery life. But, from our testing, that's not necessarily the case. Beneath the Honor 8's skin is a 3,000mAh battery, which is a large capacity given the phone's slimness, but those Kirin processors just aren't as effective as some of the competition in our experience - in terms of longevity. Over three days of use, for example, we've been using the phone normally, with minimal gaming, and achieving around 13-hours from a full charge before hitting the fairly critical 20 per cent point. However, when other phones hit such a level of charge they tend to jump off a cliff - with the Honor 8 we've felt as though its lower-end battery capacity is just as strong and full of stamina. Meaning, in essence, around 15-16-hours of use per charge - which is plenty to get you through a day. There's an added bonus too: Fast Charge. Ding, ding, you win. As is the case with many phones these days, the ability to plug in via USB Type-C and top-up on low battery levels in double time is a great feature. It's a massive help and we've found just brief plug-ins to power packs can lift the battery level from the "danger final fifth" up to half charge. First shown off in the Huawei P9, the dual 12-megapixel camera concept - which, in essence, has been ripped by the Honor 8, albeit minus the official Leica branding and optics - means the second sensor can be used (in addition to black and white capture) to derive comparable depth, the data from which is used to perform software-based depth-of-field adjustment, such as a hyper blurred background. It's an interesting idea, one explored by other manufacturers such as HTC, but an ultimately flawed one: no manufacturer has been able to create foolproof pseudo-aperture software, so often images can just look fake, or some elements will be out of focus when they shouldn't be due to localised software blurring. Use it with caution is probably the best we can say about it, especially the f/0.95 maximum which can work in some scenarios but so often exhibits issues. As a general camera, though, the Honor 8 is pretty decent for the phone's price. The sensor arrangement is a colour (RGB) and monochrome combination - just like the Leica-endorsed Huawei P9. However, accessibility for black-and-white images in the Honor is via the Mono filter selection only, which makes it different in use. In addition to the usual camera there's a so-called "Pro photo" option, which offers ISO, shutter speed (a rarity, but useful for longer exposures right through to 30-seconds), exposure compensation, autofocus, white balance and metering controls, which is about as full-on as such controls can get. Thing is, the whole from-left swipe required to get into these mode settings feels somewhat fussy - it should be available from the main screen as a one-touch option really. Quality wise the Honor 8 does a decent job. Just ignore the lack of optical image stabilisation (OIS) and slightly fussy software. Focus is rapid, detail is reasonable - although a little mottled on close inspection - while capable controls are aplenty. It's not the very best camera going overall, a title that goes to the Samsung Galaxy S7/edge, but compared to where mid-range phones have been it's in a decent position. As mid-level phones go the Honor 8 lays down some solid specification benchmarks for its £370 price. In reality, however, some of them don't quite live up to the paperwork: the battery life ought to be a little longer lasting, while the odd "hang" here and there doesn't provide perfect graphics for gaming. There's plenty of merit in bagging an Honor 8. Especially in its snazzy blue finish.